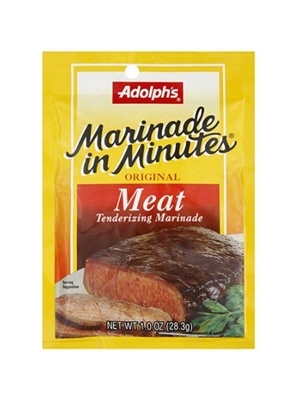 Adolph's original blend of herbs and spices gives beef, pork, lamb, veal or game a delicious gourmet taste in just 15 minutes! All you need is 2/3 cup cool water and 1 to 2-1/2 pounds beef, pork, lamb or game. ​1. Using a fork or wire whisk, thoroughly combine mix with water. Reserve 1/4 cup marinade. 2. Place meat in remaining marinade and pierce deeply with fork. Marinate 15 minutes, turning occasionally. 3. Remove meat from marinade. Discard used marinade; do not reuse. Grill, broil, bake or pan-fry, brushing with reserved marinade, until thoroughly cooked. Prepare with beef broth instead of water. Salt, maltodextrin, modified corn starch, sugar, spices (including paprika and black pepper), caramel color, onion, garlic, natural flavors (including autolyzed yeast extract, beef extract beef tallow), citric acid, bromelain (from pineapple).